This five ingredient Cheesecake Fruit Dip is simple to make and perfect for a party, snack, or dessert! It’s easy to keep all the ingredients on hand so when you’re craving something sweet or have friends dropping by, you can whip this up in no time. The cream cheese in this recipe gives this dip a nice richness and more authentic flavor, while the lemon adds brightness and the vanilla gives a nice warmth. I used a Greek yogurt brand known for being very thick this time so my dip was a bit thicker, whereas if you use a thinner yogurt yours may be creamier. 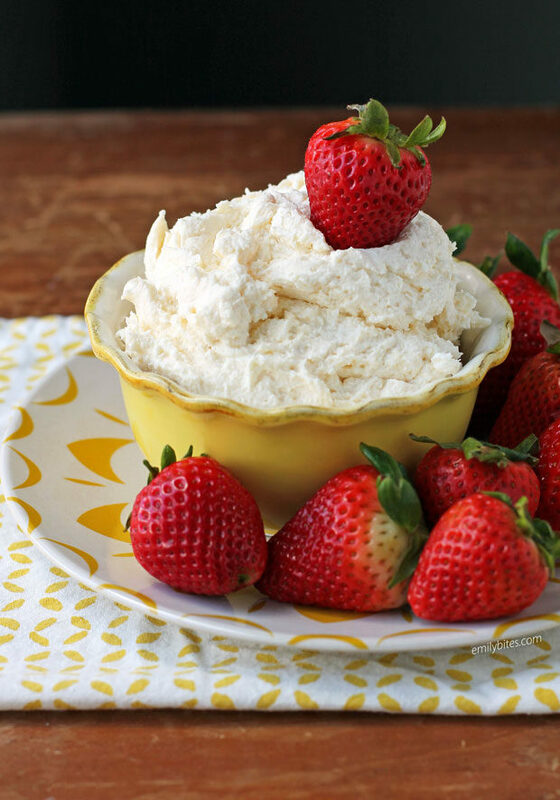 It’s equally delicious both ways, so use whatever type you have on hand and I’m sure this Cheesecake Fruit Dip be a hit either way. I don’t usually have an issue finding the sugar free fat free Cheesecake flavor of Jell-O pudding mix (I get it at Wegmans), but if you can’t track it down locally you can always order it on Amazon! I love serving this Cheesecake Fruit Dip with strawberries, pineapple spears, apples or banana slices, but it’s also pretty great right off the spoon. Not only does it taste decadent and flavorful, but a 1/3 cup serving is just 85 calories or 2 WW Freestyle SmartPoints! Looking for more tasty, lightened up dip recipes? Check out my 7 Layer Dip, Chocolate Hummus, Buffalo Chicken Dip, Ranch Hummus, Pepperoni Pizza Dip, Cannoli Dip, Chili Cheese Dip, BLT Dip, Greek Layer Dip, Creamy Dill Dip, Spinach and Artichoke Dip, Hot and Cheesy Bean Dip, Caprese Dip, Chocolate Fruit Dip and more in the dips section of my recipe index! Place the cream cheese, yogurt, lemon juice and vanilla into the bowl of a stand mixer (or a mixing bowl if using a hand-mixer) and beat on med-low until combined (should come together quickly). Add the pudding mix and continue to mix another minute or until combined. Serve with fruit for dipping and refrigerate any unused portion. Wondering what brand of Greek yogurt you used for the thicker consistency? This looks delicious and will absolutely be trying! Looks good to send in the kids lunches too! I’ll be making this tonight! Sounds delicious! Is this sweet or a little tangy? Could you add sweetener if tangy? I would use regular jello. Not sugar free. I tried this but couldn’t find the cheesecake pudding mix so I used chocolate. I also used regular yogurt instead of Greek yogurt. Yow. Best thing I ever ate!